For other places with a similar name, see Attleborough (disambiguation). It is rumored that George Washington once passed through Attleborough and stayed near the Woodcock Garrison House at the Hatch Tavern, where he exchanged a shoe buckle with Israel Hatch, a revolutionary soldier and the new owner of the Garrison House. 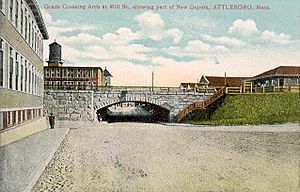 Attleboro is located at (41.933, −71.3) and has a total area of 27.8 square miles (72.0 km2), of which 26.8 square miles (69.4 km2) is land and 1.0 square mile (2.6 km2), or 3.59%, is water. Its borders form an irregular polygon that resembles a truncated triangle pointing west. It is bordered by North Attleborough to the north, Mansfield and Norton to the east, Rehoboth, Seekonk, and Pawtucket, Rhode Island, to the south, and Cumberland, Rhode Island, to the west, as well as sharing a short border with Central Falls, Rhode Island through the Blackstone River. It includes the areas known as Briggs Corner, Dodgeville, East Junction, Hebronville, and South Attleboro. 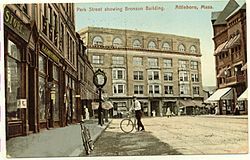 Attleboro sits on the border between the Massachusetts and Rhode Island regional dialects of New England English: the eastern part of the city is in the same dialect region as Boston, and the western part is in the same dialect region as Providence. As of the 2010 census, there were 43,593 people, 16,884 households, and 11,212 families living in the city; the population density was 1,626.6 people per square mile (628.1/km²). There were 18,022 housing units at an average density of 672.5 per square mile (259.7/km²). The racial makeup of the city was 87.1% White, 3.0% African American, 0.2% Native American, 4.5% Asian (31.5% Cambodian,1.3% Indian, 0.4% Chinese, 0.4% Vietnamese) 0.1% Pacific Islander, 2.8% some other race, and 2.2% from two or more races. Hispanic and Latino people of any race made up 6.3% of the total (2.0% Puerto Rican, 1.7% Guatemalan, 0.5% Mexican, 0.4% Salvadoran, 0.3% Dominican, 0.2% Colombian). Most of the Hispanic and Asian populations were concentrated in the East Side. For the period 2009–2011, the estimated median annual income for a household in the city was $63,647, and the median income for a family was $71,091. Male full-time workers had a median income of $52,558, females $40,954. Per capita income was $30,039. About 4.2% of families and 6.8% of the population were below the poverty line, including 6.4% of those under 18 and 7.8% of those aged 65 or over. 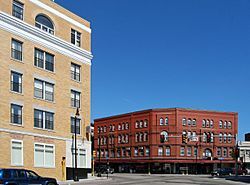 In December 2011, the City of Attleboro was awarded $5.4 million in state and federal funding to support revitalization efforts within the city's Historic Downtown area. The city's "Downtown Redevelopment and Revitalization Project" is intended to transform underutilized industrial and commercial parcels into areas of mixed use that include commercial, recreational, and residential space. The project also includes transportation improvements to both MBTA rail and GATRA bus services along with enhanced road construction. Congressman Jim McGovern highlighted the importance of this project in 2011 by saying, "This transformative funding presents a landmark opportunity for Attleboro to reshape its downtown and make a strong community even stronger. The new transit plan, when implemented, will make Attleboro a model for other small cities, and the aggressive reclaiming of contaminated sites will enhance economic development." Second Congregational Church (1748), near the town common, is typical of a New England town and is the founding church of what was then East Attleboro. It is a daughter church of the First Congregational Church in the Oldtown section of North Attleborough. Originally located in a meeting house on what is now the common, Second Congregational had a stately white clapboard building built in 1825. It was removed in the early 1950s to make way for the addition of a new Fellowship Hall and education rooms. The main red brick building and clock tower were built in 1904 beside the white church. In the early 1960s the interior of the sanctuary and the entrance were dramatically remodeled, resulting in a blend of high Victorian style and the open feel of mid-century modern. The church owns the Old Kirk Yard Cemetery to its rear, where many of the town's earliest families are buried. In its tower is the clock, owned originally by the city and now by the church. The Jack & Jill School has operated at the church for over 60 years. One of the city's elementary schools is named in honor of the church's first settled minister, the Reverend Peter Thacher. Protestant denominations represented in Attleboro include Baptist (Grace Baptist on Oakhill Avenue, Word of Truth Baptist on Union Street, and First Baptist on South Main), Advent Christian (also on Pleasant), Fruit of the Spirit Mission Church (Leroy Street), and Assembly of God (the South Attleboro AOG on Newport Avenue). The Bethany Village Fellowship, formerly Bethany Congregational Church, (1886) is in Newport Avenue. Murray Unitarian-Universalist Church (1875) is on North Main Street. Evangelical Covenant Church (1903) on North Main Street recently celebrated its 100th anniversary. It was once "the Swedish church", but includes many different ethnic groups today. Kingdom Hall of Jehovah's Witnesses is located on Commonwealth Avenue. The Attleboro Seventh-day Adventist Church is located on Elmwood Avenue across from Capron Park. Attleboro, Massachusetts Facts for Kids. Kiddle Encyclopedia.